Edit: The Huffington Post weighs in on the issue here with more info and links. YouTube has removed this ad due to DDB copyright. It is re-posted here along with a link to a story about how the ad came to be. The Bush administration has a well established pattern of using the anniversary of the September 11, 2001 terrorist attacks to hype an often fictional "threat to America" and sell the war in Iraq, writes the New York Times' Frank Rich in his Sunday column. Rich expects this year to be no different. "When the September 'snapshot' of the surge shows little change in the overall picture, the White House will say that 'the consequences' of winding down the war would be even more disastrous: surrender, defeat, apocalypse now. So we must stay the surge," says Rich. Using the September anniversary to push the Iraq war is not a new strategy, according to Rich. On Sept. 8, 2002, three Bush cabinet members and the vice president fanned out across morning talk shows to warn of the threat posed by Saddam Hussein and his alleged nuclear program. That was the date of Condoleezza Rice's infamous "mushroom cloud" line. May 27, 2007 -- SUPPORT for the loopy 9/11 documentary "Loose Change" - which argues that the World Trade Center terror attack was part of a secret U.S. government conspiracy - is quickly losing steam. NOTE: Ron Paul is the only presidential candidate to have given an audience to 9/11 truth. Whether ABC purposely left Cong. Ron Paul out of their poll, or whether they're just so arrogant that they just assumed that they know who the candidates are, or should be, they got a cold slap in the face the other day. After deciding to ignore the 800 pound gorilla on the debate the other night, they thought by not including Mr. Paul in their 'poll', they could steer the results in the direction they wanted. It didn't take long ! Pretty soon the net erupted and they were swamped with calls and emails demanding that Ron Paul be included. Well it didn't take ABC long to figure it out, they knew they were busted. They then did the only thing they could, they scrambled to get out in front of it by quickly including him in the list which resulted in these results ! View Here ! Let's face it, if the 9/11 attacks were "legitimate", they would have been accompanied by "legitimate" statements and claims of responsibility. You don't pull off the most spectacular "terrorist" attack in history, especially against largely symbolic targets, and then hide. You don't put yourself through the expense, trouble, risk, etc., of carrying out the most daring "terrorist" attack in world history, only to let a panel of fatuous government apologists tell the world what your ostensible motive was; e.g., "they hate us because of our 'freedom'", or some such puerile nonsense. Moreover, someone totally committed to the idea of stopping U.S. imperialism/aggression against his people, country, etc., and willing to die to do it, obviously wouldn't have to be tortured into admitting it. I mean, contrary to what the U.S. government would apparently have us believe, an ideologue doing a 9/11 would be different than, say, a greedy person doing in his rich uncle to collect the inheritance money. NBC veteran reporter Pat Dawson 'blows up' at 9/11 Truther Dan Wallace, who lost his father, Lt. Robert Wallace; a fire fighter who died in the Towers on that fateful day. Personally, I think Mr. Dawson's frustration is enigmatic of the outrage many of these veteran news reporters must be feeling concerning 9/11... "the GREAT ENIGMA". For him to snap on Dan that way ON VIDEO in the AGE OF YOU TUBE betrays an inner tourmoil that must be eating these so-called "journalist" alive. An emotional outburst like that can literally cost a journalist his career. Particularly in response to a TABOO subject like 9/11. Imagine spending twenty years of your life building a career within the so-called "fourth estate"... starting out with very high and noble ideals... only to have your world to be revealed as nothing more than a sham, a con, a veritable travesty of the very things you "claim" to stand for in the Journalist's Creed. Perhaps that's why Mr. Dawson stormed off in disgust. He was afraid of what he might say next. Motivations for allowing 9/11 to happen: Create pretext to seize Middle East oilfields (to control Earth's oil supplies after Peak Oil) and enact "Homeland Security" police state. Debris that may have contained bits of bone from victims of the World Trade Center attacks was used to fill potholes and pave city roads, according to court papers filed on Friday. Sam Seder promotes "9/11 Guy" as winner of Daily Kos contest. Not that I am surprised, but it does not sound like Sam Seder is very excited about promoting 9/11 Truth on Air America. Correct me if I'm wrong, but he cuts off "Robert" an obvious 9/11 Truther, before he gets his full thirty seconds in. Robert was slamming Rudy Giuliani for goodness sakes! Sam could have at least given him his full thirty seconds! 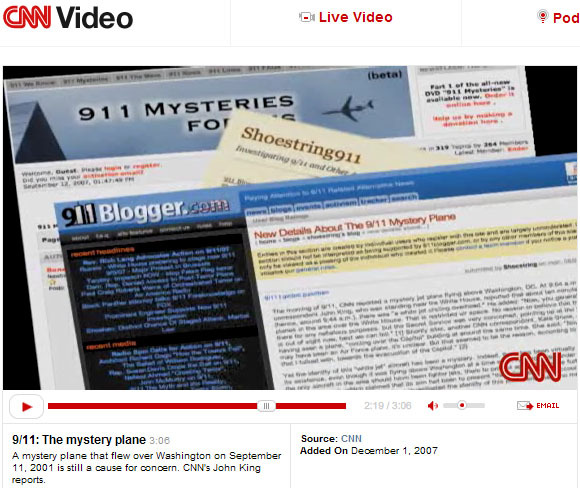 Will he try and cut 911blogger.com short too? And why does Sam refer to the winner of the Kos Contest as the "9/11 Guy" instead of "9/11 Blogger.com"? Does anyone else have a problem with that or am I just being too sensitive? Perhaps they want to draw as little attention as possible to the fact that 911blogger.com won the Daily Kos contest.